If you are a long-time reader than you may know that I have put my body through a lot of trauma in my 29 years. I have 2 fake discs in my neck, I have a metal rod, a metal plate and screws in my right leg. Along with all of that I also have a herniated disc in my lower back, carpal tunnel and several muscles spasms in my back and neck as a result of my trauma. Yes, I am a disaster. Needless to say; I have arthritis and pain. 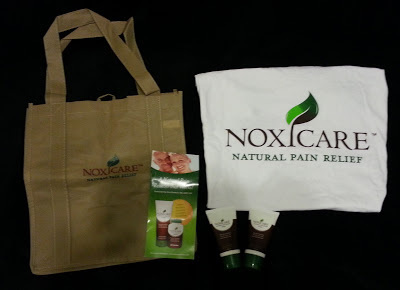 I first heard of Noxicare Natural Pain Relief Cream a few months ago from another blogger. I have wanted to try it since then and I was really excited when I was presented with the opportunity to do a review and giveaway for them. "Noxicare is a breakthrough natural, patent-pending pain relief formula that is a proprietary combination of 7 of the world's most potent natural pain relievers that quickly and effectively alleviate inflammation, muscle aches and never pain - without any known side effects and without a prescription." Noxicare was developed by Dr. Reza Ghorbani who is a Harvard trained, Board Certified Interventional Pain Management Specialist. This is an awesome package, but I was really excited for the cream. Noxicare is all Natural, Non-Greasy, Paraben-Free, Effective, Odorless and Safe. The ingredients are: Turmeric, Willow Bark, Ginger, Holy Basil, Rosemary Extract, Alpha Lipoic Acids and Boswellia Extract. That's it! This stuff is amazing! Seriously amazing. The first time I applied it to my back I was a little perplexed because I didn't really feel anything. Then I realized; I didn't feel ANYTHING...including pain. I was hurting when I had first applied it. With other topical pain creams, ointments, etc. that I have used they have been heavy on menthol. They only somewhat mask the pain through the burn of the menthol. They also make you stink and everyone can smell you from 20 feet away. That is not the case with Noxicare. It is not completely odorless, but the smell is very faint and it doesn't stink. Even better, the cream actually relieves your pain. It doesn't just mask it like other pain creams. So this pain relieving cream actually works and you can put it on anytime and anywhere without smelling like a tub of menthol. In addition the cream is not yucky feeling. I am OCD when it comes to washing my hands and I normally have to wash away any lotions, creams, etc. as soon as I apply them. 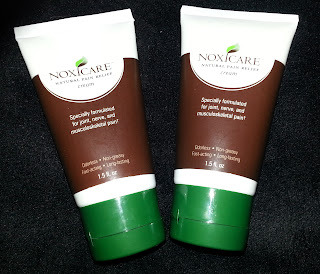 With Noxicare I can apply it after I am in bed or while I am in the middle of working without having to run to the bathroom and wash my hands immediately. Another thing that is amazing about Noxicare is that it relieves not only muscle pain, but pain associated with joints, nerve pain and arthritis. I have been using it quite often on my knee (it hurts from where the Doctors had dislocated it and it sometimes gets fluid in it), my right wrist (where my carpal tunnel and nerve pain are the worst) and my lower right back (where I have a muscle knot that gets flared up due to the herniated disc). It has worked great for all three areas. Within minutes of applying my pain is gone. Noxicare Pain Relief is also available in capsules. For natural pain relief that works, I highly recommend Noxicare. Noxicare™ Natural Pain Relief is happy to announce that this Friday (March 1st) they will be giving away an Amazon Kindle eReader. All you have to do is sign up for their eNewsletter here and "LIKE" them on Facebook here and you're entered to win! My back could really use some relief! I also recently developed a chronic pain in my elbow. Nice. I would use it on my lower back. My husband could really use something like this, he does juijitsu and is always hurting somewher. I want to use this cream on my upper back and shoulders. I'm going to look for this after reading your review. Instant freedom from pain is always a good thing! I would use it mostly on my upper back, shoulders and neck. I have fibromyalgia so I am in pain a lot of the time. I'd love to try this product and see if it offers some relief. My wrist-from typing all day! This sounds great! Can't wait to use it. oh I would love to try this. I have arthritis in my spine, shoulders, hands, feet and knees. I was just diagnosed with fibro and so far I haven't found anything to help with the pain although lavender essential oil does help. Back of my neck, I get terrible stiff necks and also stress headaches. I want to try this for my arthritis! I have RA and my knees & wrists and neck want to try this. wow, you must have a lot of pain. If this product helps you, I'm sure it would offer some relief to my back pain. Thanks for sharing! My back is what bothers me so much. This sounds like it may would help. Thanks for sharing. I would use it on my knee and back. I want to use the Noxicare on my knees; as they get tight and sore when in the same position for a long time. My lower back and neck. I need to try this stuff, I've had back problems for over 20 years!